Over the many years I’ve worked in this field, I have heard from so many people with a substance use problem who have struggled to understand their addiction. They had a strong desire to give up using drugs or stop drinking, but had no idea how to go about it. They had tried to stop using or drinking on numerous occasions, but kept on relapsing. Even though they had been in and out of treatment, this had not given them a real understanding of what it takes to recover from addiction. They had become confused and frustrated by their lack of progress (and the failure of treatment services to help them). They had lost confidence and self-belief, and their self-esteem had become so damaged they had contemplated suicide as the only way out of their problems. Many of these people also spoke of the positive impact of coming into contact with recovering or recovered people had had on their lives, and how this had been fundamental to their recovery. They described how they related positively to these recovering people, role models who spoke the same language, and shared similar experiences, thoughts and feelings. These role models showed both that recovery is possible and that there are many pathways to recovery. They were people who could be trusted and who understood the nature of a life of addiction. Role models are so important because recovery is something that comes from the person. It is not something given to a person by a treatment service or practitioner. The person with the substance use problem does the work. But recovery is also a social process. People learn from other people about the nature of their problem (addiction), the solution (recovery), and what they have to do to take the journey to recovery. Given all of this, it is surprising that there are so few widely circulated recovery“guidebooks” written by people who are in recovery. Most of the books on substance use problems focus on addiction, rather than becoming well. Many books are too academic. 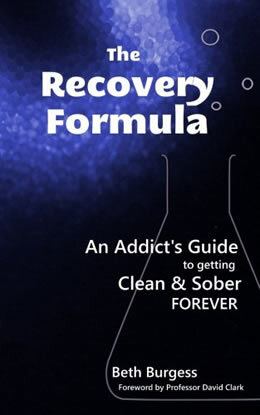 What people who want to overcome their addiction need is a simple book that provides information about the fundamental building blocks of recovery. A book to which they can relate. That is exactly what Beth Burgess has done in her wonderfully refreshing book The Recovery Formula. Beth talks about the essential elements underlying recovery in a beautifully accessible way. A way that comes from experience – and will be easy to relate to for people who want to recover from a substance use problem. She describes the sorts of things she attempted when trying to overcome her own drinking problems, some of which helped her move towards recovery, others which did little or in fact impeded progress. Beth’s description of her past shows how easy it is for an uninformed person to stumble from one unhelpful tactic to another. Beth’s book describes a framework comprising four key building blocks to recovery. She tells people they must: Get Honest, Get Held, Get Committed and Get Replacements. I’m not going to go into detail here, but what I will say is that Beth talks about key principles that have been shown to facilitate recovery. These principles are known to play a significant role in successful treatment approaches, mutual aid and self-help approaches. The Recovery Formula succeeds because it provides people in need of help with a solid, proven framework in an easy-to-understand way. Beth speaks as a person who “has been there”,explaining pitfalls as well as helpful strategies, allowing the reader to gain a firm footing on the path to recovery, rather than stumble around and get caught in the common traps that await the unwary. The book empowers the reader with information that will directly help their recovery, as well as help them understand the resources in their community that will facilitate their recovery. What is also brilliant about this book is that it embodies what recovery is about, and what recovering addicts can achieve. Recovery is not just about stopping the use of substances. It is about getting your whole life back, developing new networks, new interests and moving forward. As Beth points out, recovery is about getting better physically, mentally and emotionally – and achieving a life that you enjoy and of which you are proud. Recovery is also about connecting with other people. It is about helping other people, as so beautifully illustrated by Beth, both in relation to her book and her role as a recovery coach. There is a blossoming Recovery Movement, which is engaging people who want to recover from addiction and those who are already on their journey. This rapidly growing Recovery Movement is inspiring hope, showing how people find recovery, and providing the opportunity for people to engage in mutual support. People are starting to celebrate and share their recoveries more publicly, by telling their stories, blogging on our online recovery community Wired In To Recovery, participating in Recovery Walks, engaging in Conversation Cafes, and by setting up Recovery Cafes. Now we have a new book about recovery, one which I recommend strongly. I am sure you will benefit from reading this book. I hope you will help others benefit as well. (You can do this by telling other people about the book, asking they purchase their own copy, and then tell other people. In that way, you will be helping spread recovery, providing other people an important tool (this book) to help them overcome their substance use problems and better their life.) Do you need this bit? Remember, Recovery is Contagious. Let’s make The Recovery Formula contagious.